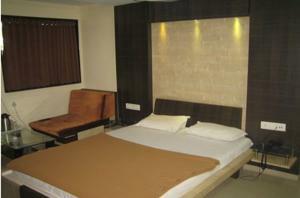 Modern rooms with free Wi-Fi are available at Hotel Vijay Lakshmi Inn. Just 300 metres from Haridwar Bypass Road, it provides free private parking and has its own multi-cuisine restaurant. 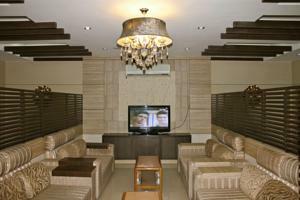 Located in the holy city of Haridwar, Hotel Vijay is 1 km from the small town of Jwalapur. 4 km away is the famous ghat Har Ki Pauri, located on the banks of the Ganges. Haridwar Railway Station is 2.5 km away while Jolly Grant Airport, Dehradun is 35 km from the hotel. Air-conditioned and equipped with dark wood furnishings, each room features a flat-screen satellite TV, electric kettle and minibar. A wardrobe and work desk is included. Private bathroom comes with a shower and free toiletries. Luggage storage facilities and newspapers can be found at Hotel Vijay Lakshmi Inn. Dry cleaning and laundry services are available at an extra cost. The hotel also offers room service and a tour desk. Free! Wi-Fi is available in public areas and is free of charge. Wi-Fi is available in the hotel rooms and costs INR 200 per hour. Free! Up to two children under 12 years stay free of charge when using existing beds. One further older child or adult is charged INR 500 per person per night in an extra bed. The maximum number of extra beds in a room is 1. There is baby beds in a room is 0 capacity for cots in the room. Any type of extra bed or crib is upon request and needs to be confirmed by management. Supplements are not calculated automatically in the total costs and will have to be paid for separately when checking out.